Multiple smartphones were stolen Saturday from a group of teens aged 14 to 16 who were playing basketball at Ancaster Meadowlands park, police said. 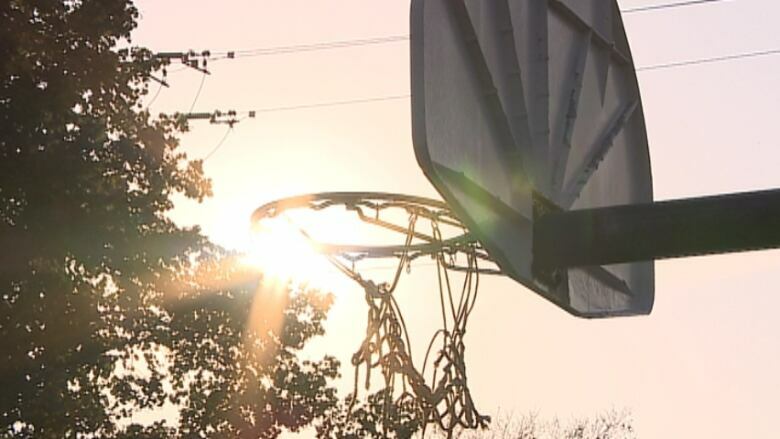 A group of teenage boys was playing basketball after one of the boys' birthday parties on Saturday evening in Ancaster when their game was interrupted. Three older teens came up on bikes and demanded the boys turn over smart phones. One fought back and was assaulted, Hamilton police said. Police went to the scene around 6 p.m. and are investigating. The boys are all very upset, said a parent of a 16-year-old boy who was there, Imtiaz Kiani. "There are 10 families that are very upset at the moment and going through emotional trauma," Kiani said. Kiani said the boy who was beaten up sustained injuries to his arm, face, eye and a nosebleed. "His whole face was swollen," he said. Police said more than one phone was stolen. The suspects fled north toward the soccer field, police said. Kiani said one of the boys was forced to log out of iCloud on his phone before it was stolen. Black male, late teens, taller than 6-feet, medium build, short hair, wearing a red The North Face hoodie and jeans, with a nose and ear piercing. Black male, late teens, about 6-feet tall, skinny build, short hair, black hoodie, black undershirt and jeans. Black male, late teens, taller than 6-feet, skinny build, short hair, hoodie, jeans. Kiani said the incident is alarming. He said his son and the others didn't recognize the kids on bikes from growing up at Ancaster Meadows or Ancaster High, and so they concluded they are not from the neighbourhood. "My kids would have recognized them – everybody recognizes each other because they go to the same school," Kiani said. "They're saying they were armed. They had something in their pocket," Kiani said. Police said they are not currently investigating any other incidents in the area. They did not say anything about reports of the suspects being armed. "Whoever is responsible for crimes like these can expect the courts to consider the full extent of the law if and when caught," said Hamilton Police Const. Stephen Welton.